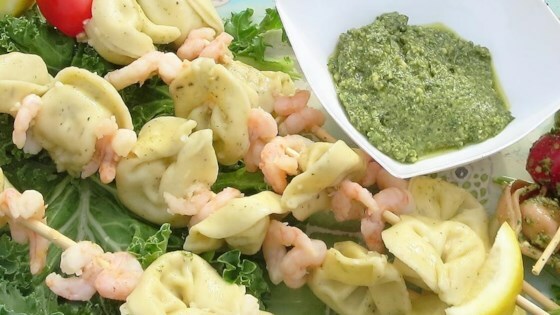 "Cute appetizer of alternating grilled shrimp and cheese tortellini." Bring a large pot of lightly salted water to a boil. Cook tortellini in the boiling water until tender yet firm to the bite, 2 to 3 minutes; drain. Heat olive oil in a skillet over medium heat; cook and stir garlic until fragrant and tender, 1 to 2 minutes. Add shrimp and cook until heated through, 2 to 3 minutes. Mix tortellini into shrimp mixture, remove skillet from heat, and cool until easily handled. Thread tortellini, shrimp, tortellini, shrimp, and tortellini onto a skewer, ending with a tomato. Repeat with remaining ingredients. Mix sour cream and ranch dressing mix together in a bowl; serve with skewers.